Chewy, nutty and filling, brown rice has a lot going for it. 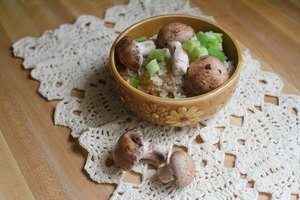 Classified as a whole grain, brown rice contains an abundance of B vitamins, lots of healthy minerals, a good amount of protein and five times the fiber of white rice. What's more, studies suggest that brown rice may cut your risk of diabetes, lower your cholesterol levels, and help you maintain a healthy weight. But if you have some leftover in the frig, make sure it's still good. The U.S. Department of Agriculture is ready to help you determine whether the brown rice in your cupboard or fridge is still safe to eat. It suggests that cooked brown rice stays safe for four to six days in a refrigerator, and that uncooked rice in your cupboard stays safe for three to six months whether the package is opened or not. Cooked rice retains its quality in the freezer for up to six months, while raw rice retains its quality for 12 to 18 months. Both types stay safe indefinitely in the freezer, but freezer burn may dry out the grains enough to make them inedible. While the federal guidelines give you a measure of days to go by when deciding whether your rice is bad, you also need to examine it yourself. If the rice looks slimy, filmy or off color, it's unsafe to eat. If the grains look darkish and are hard as a rock, the rice is also bad and will never regain its quality. Likewise, if you detect an off odor, however slight, the rice has gone bad. 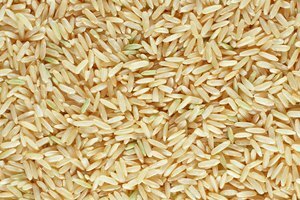 With uncooked rice, you may see insects in the rice or crumbled pieces – both signs that you need to toss the the rice. 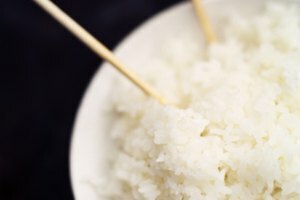 Don't be tempted to just skim off the bad parts or pick out hard grains, because bacteria you can't see may have spread into the rest of the rice. Err on the side of safety, and make a new batch. Whether cooked or raw, brown rice will stay safe only if the conditions are right. Keep uncooked rice in a tightly covered container or heavy-grade plastic bag to help ensure it stays free of bugs and moisture. When freezing uncooked or cooked rice, use freezer-grade plastic or foil. And, never leave cooked rice out at room temperature for longer than two hours, because harmful bacteria can double their numbers in only 20 minutes. If your refrigerator or freezer are not set to the proper temperature, your brown rice will spoil much more quickly than normal. Use an instant-read thermometer to check that the refrigerator section is at 40 degrees Fahrenheit or below and that the freezer registers 0 degrees Fahrenheit.